1. Preheat the oven to 220ºC, gas mark 7. Place the oil in a large cast iron gratin dish or roasting tin and heat in the oven until very hot. Add the sausages, sliced onion and apple quarters and baste with the hot oil. Tear the sage leaves into pieces and scatter over the sausages. Cook in the preheated oven for 10 minutes until sausages are just starting to brown. 2. While the sausages are cooking, sift the flour into a bowl and season. Whisk in the eggs and milk to give a smooth batter. 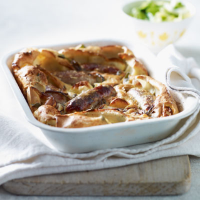 Pour the batter over the sausages and return to the oven for 25–30 minutes until the batter is puffy, crisp and golden and the sausages are browned and cooked through. Serve with creamy mashed potato and spring greens. You can make individual toads by using small cast iron gratin dishes and cooking at step 2 for 20 minutes. There’s nothing better with the pork and apple in this dish than a deliciously crisp, refreshing cider. Try the brilliant Dunkerton’s Organic Black Fox, Herefordshire. Cider is a good match for this dish. See what Waitrose has to offer here. Browse our cider assortment. (opens in a new window). This recipe was first published in April 2011.